When the fleet's food supply becomes contaminated, everyone is in danger of starving to death. In a daring exploratory mission, Sharon discovers a planet teeming with edible algae — but it's on the far side of a massive star cluster. Flying around the cluster will take too long, and flying through it will expose the unshielded civilian ships to intense, deadly radiation. Admiral Adama decides that the radiation-shielded Galactica will shuttle groups of civilians through the cluster. Simultaneously, the shielded Raptors will each shepherd a civilian ship, empty except for a skeleton crew, along the same route. They'll have to make five trips of two Jumps each to transport the entire fleet to the far side. 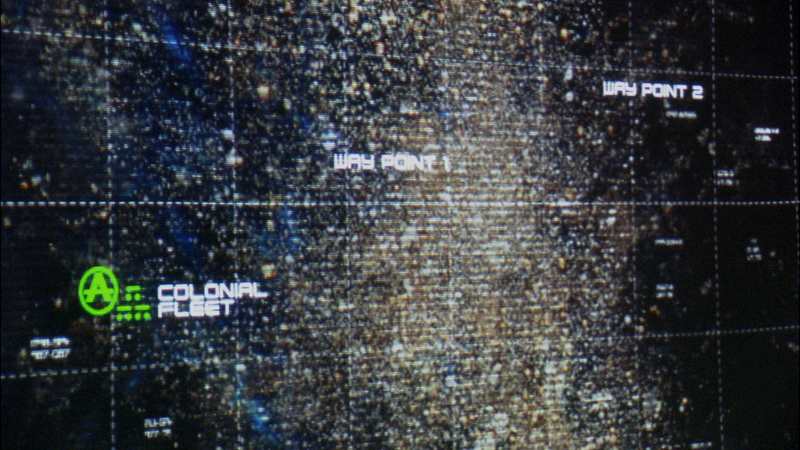 The journey's midpoint, when the ships emerge into real space in the center of the cluster, will be the most dangerous part. There, disoriented by blinding starlight, the Raptor pilots must each establish the exact location of their civilian ships and transmit Jump coordinates to them before they can move on. As civilians board the Galactica, a man named Enzo confronts pilot Capt. Louanne "Kat" Katraine. She dismisses him, but he pursues her, warning her that she can't deny her former life forever. As Kat runs away from her old identity, Gaius Baltar, still far away with the Cylon fleet, searches for a new one. With D'Anna's help, he tries to discover if he's one of the five human-form Cylons whose faces have never been seen. The clues he finds, however, lead him instead toward another rendezvous with the humans he has betrayed. Back at the star cluster, the first group of ships Jumps away. At the journey's midpoint, one civilian ship, the Adriatic, is lost forever amid the glaring starlight and deadly radiation. Later, on the fourth trip, Kat also loses the ship she was assigned to guide. With only one trip left to make, she and her fellow pilots are heartsick and weakened by radiation exposure. Enzo resurfaces, and Kat argues with him. Then Starbuck corners Kat and demands an explanation for the fight. Kat finally confesses that she used to be a drug-runner; Enzo was her supplier. She lied about everything — even her real name — to become a pilot aboard the Galactica. - Apollo notes that there are 8 ships taken through the star cluster per trip and that there are 5 trips. Are there really 45 civilian ships in the fleet? - Among what I could discern of the hybrid's speech this episode: "[...] one degree. Angle nominal. Seascape portrait of the woman child, cavern of the soul. Under pressure, heat ratio. Miles of evolution have buried their fears. [...] Throughout history the nexus between man and machine has been some of the most dramatic, compelling, [...] and entertaining [...] " Then when Baltar reaches out to her: "Intelligence. A mind that burns like a fire. Find the hand that basks in the shadow of the light. In the eye of the husband of the eye of the cow." - Baltar: "I'll never understand what you all do all day long. Living on this thing like fleas on a cat." - Baltar confronting D'Anna about her repeated suicides. - Tigh returning to CIC. - The fleet taking immense damage in the star cluster. - Hot Dog losing the Adriatic. - Kat losing the Carina. - Pilots returning, Hot Dog throwing up, and Apollo attempting to brief his pilots. - The Adama and Tigh laughing scene. - Starbuck confronting Kat about her past. - Baltar and D'Anna visiting the hybrid. - Kat realizing that she's losing her hair. - Adama visiting Kat and promoting her to CAG again. - Starbuck hanging a photo of Kat under the photo of Riley's girlfriend, which Kat obsessed over in Scar. Much like Torn, this episode is all setup for a confrontation between humans and Cylons in the next episode. This aspect of the episode is done quite well, because it merges an important issue in the fleet with that overall plot goal. A food shortage is something I've been waiting to see in the fleet since Water, in which Baltar outlined what seemed to be very difficult to sustain food requirements for the fleet. They turned out to be not so difficult to sustain after all, for over a year went by and this is the first time a food shortage ever became a problem. There was so much food to go around even that Lee Adama could gorge himself on it! I suppose better late than never is the best axiom to describe the food plot, as I appreciate that it's being addressed at all. I also am quite amused at the whole idea of the fleet harvesting and eating algae. How delightfully disgusting! Though as a whole, The Passage is an episode which does too much at once and therefore does none of it very well. Aside from the food crisis occurring way too late in the show, it spontaneously becomes a problem in the most contrived way. The food processing ship breaks down. This sounds like the premise from an original series episode. A better way to broach this topic would have been to have a gradual food shortage begin to take shape right after the exodus from New Caprica, until it culminates into food riots, then forcing the fleet into taking the drastic, risky measures taken in this episode. This brings us to the idea of the passage through the star cluster itself. The plot frames the issue as there not being enough time to jump around the star cluster. Why? Jump travel is instantaneous. Was there not enough time to calculate the jumps or something? Unfortunately, the science fiction stuff in this episode's plot is only very loosely and quickly glossed over so that the show can get on with the drama. This is usually a good idea, but in this case instead of just painting a deliberately vague picture, it just comes across as confusing and requires the audience to fill in the blanks in order for it all to be plausible. What I did like about the passage through the star cluster was the apparent immense losses suffered by the fleet. Extreme damages to all ships was suffered, including that nice detail depicting the Galactica's logo peeling. The raptors are all pockmarked, and at least two ships were destroyed. All very sobering stuff! What didn't work for me so well aside from technical issues was Kat's story. While I agree with RDM who stated that a human price should have to be paid for such a perilous journey to be believable, and that it should be a character we already know fairly well, Kat's story felt somewhat insincere until the very end. Honestly, I don't think we needed any new details about Kat's life; Enzo was almost painful to watch and I don't think the revelations about Kat's past added anything worthwhile to the plot. It would have been more moving if the episode simply surprised us with Kat's defiant "I'm not losing another one!" attitude at the very end. That would also make her noble sacrifice seem more noble and less like a drama queen acting on her death wish. Even the Baltar / D'Anna story, which I felt was the strongest and most interesting aspect of the plot had its weaknesses. Just like the technical details of the passage, the method by which Baltar discerns the Cylons' next move is glossed over rather quickly. In the scene with the hybrid, we're treated to a fast moving dialog between Baltar and D'Anna in which Baltar very loosely derived meaning from symbolism in the hybrid's speech almost like when Data spouted a bunch of meaningless technobabble on Star Trek TNG. Here's a quick summary of the exposition. The eye of the cow refers to Hera because she's sometimes referred to as the cow-eyed hero. The husband of the eye of the cow is Jupiter, because Jupiter was Hera's husband. The hybrid says to find the hand in shadow of light which Baltar assumes is a star cluster. The hand he assumes must be some kind of artifact and the symbolism of five fingers on a hand must refer to the five missing Cylons. Now that's a lot to swallow at once! Moreover, that's a lot of leaps of logic for Baltar to make on what seems like fairly flimsy ground. A little more depth and explanation would have been appreciated. Instead, this felt more like a handful crazy coincidences. I do, however, like the idea that D'Anna has become obsessed with discovering who the final five Cylon models are. I also much enjoy Baltar's complicity in this quest. The episode has numerous details large and small to sustain its value, in fact. Aside from the various nice elements in the main plots, little details like Tigh returning to CIC are worthwhile along with the Adama and Tigh paper shortage goofiness. Again, the Galactica's lettering peeling away was a nice touch, as was the inclusion of Riley's girlfriend's photo at the end, and depicting Lt. Hoshi, a former Pegasus officer, as having a key role on the Galactica CIC now. Overall though, this is an episode that falls below average. For all the nice details there are equally as many goofs and annoying details. For an episode with this much plot advancement and long term consequences, it almost feels filler, and certainly feels under done. Key elements of the main plots should have been explored in more depth. So, a nice episode, but could have been a lot better. I think this episode was a wasted opportunity. Kat is a character that started as a bit player, and grew with the series, so her death (like Helen's) is meaningful. But the various pieces never quite click together here, and even the events leading to her death seem a bit contrived. Also, the episode is way to much 'standalone', i.e., a problem appears and is resolved in the episode, with no ramifications before or after.